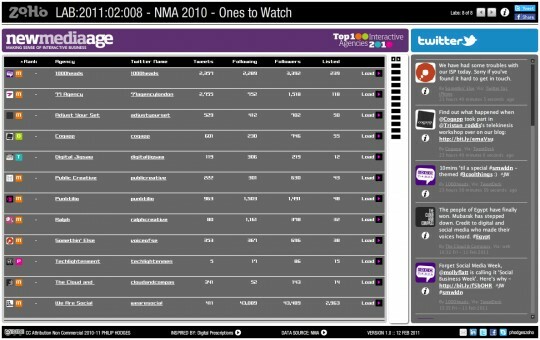 Once I had completed the Twitter client for the NMA Top 100 it was a fairly simple thing to modify it to load in the NMA 2010 “Ones to Watch”. 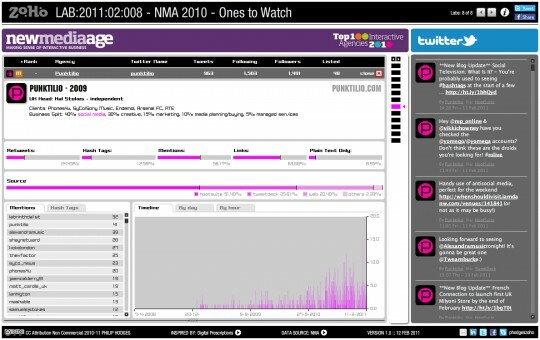 This entry was posted in Data Visualisation, Interactive Data, Lab Examples and tagged Actionscript, API, Data, Interactive, New Media Age, NMA, NMA Top 100 Interactive Agencies, Twitter. Bookmark the permalink. Post a comment or leave a trackback: Trackback URL.